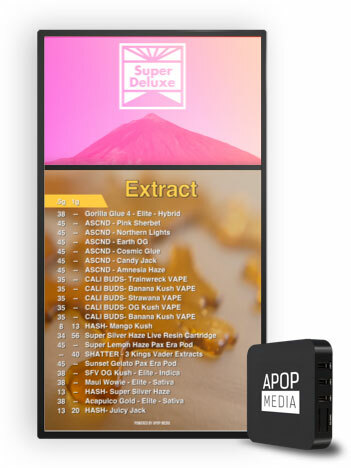 APOP Media is the largest in-store cannabis lifestyle network & digital menu platform based in LA and has quickly evolved into the market’s leading advertising and educational service. 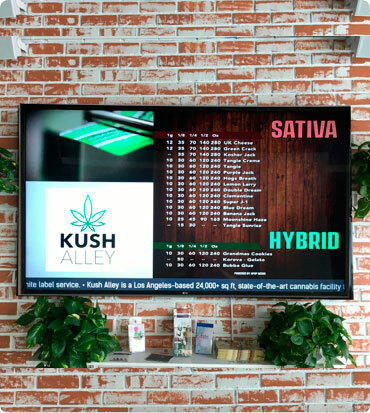 Strategically placed in dispensaries, waiting rooms, med rooms, doctor’s offices & at live events across California. 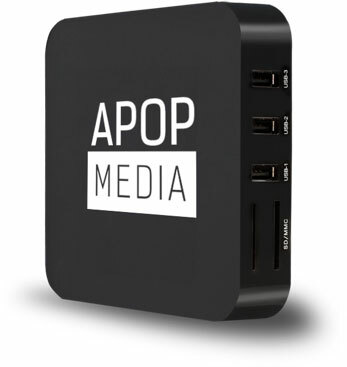 APOP is in over 250 locations and reaches over 2 Million consumers each month. 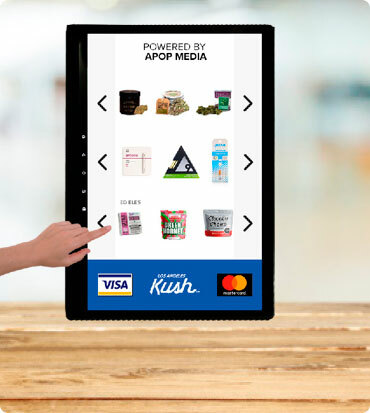 APOP creates a professional retail environment that educates and influences customer to buy the best products at the point of purchase where 92% of purchase decisions are made entertainment and targeted advertisements right when they are making a purchase decision. 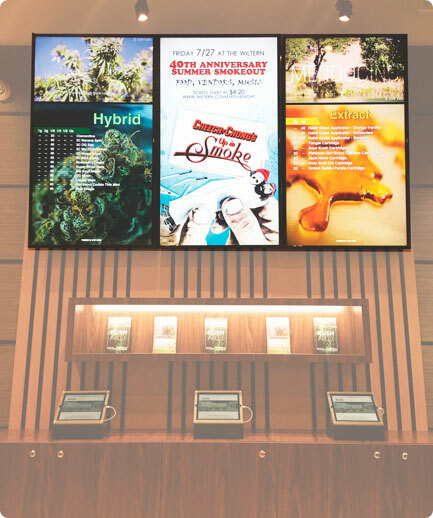 EZ-MENU provides smart, robust and easy to use digital menus to legal shops. 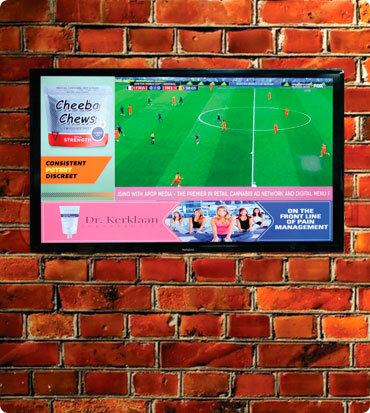 The menus can be created within minutes and convenient to manage. The system is remotely programable from anywhere with an internet connection. 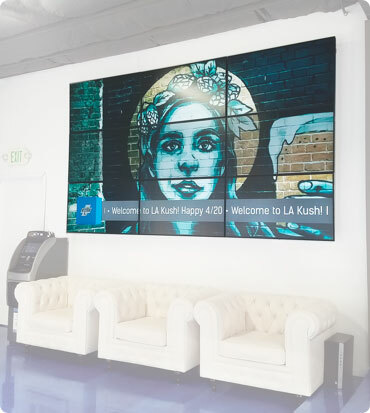 Catch the eyes of your customers through vibrant HD displays and enhance your dispensary experience..
APOP Media strategically places brands in front of a receptive audience on our network of dispensary retail partners. 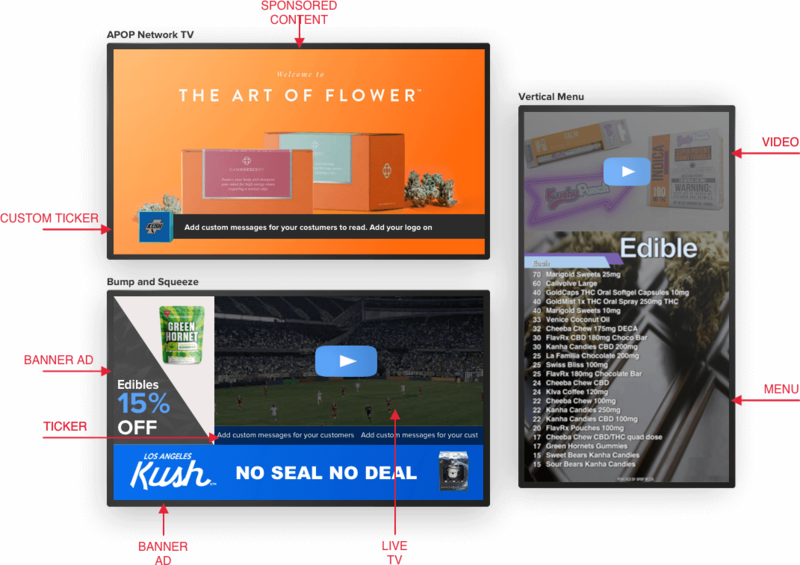 Our exclusive ad portal showcases brands & their products, featuring a combination of cannabis-driven entertainment, brand advertisements & educational content. 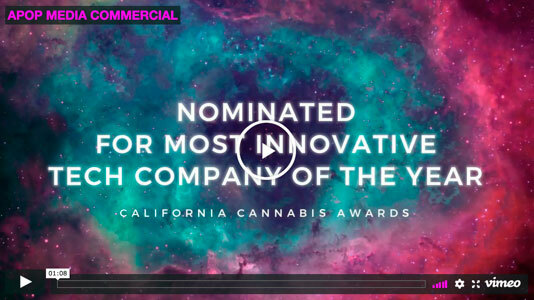 APOP reaches cannabis consumers at the most pivotal point in the purchasing decision with brand advertising integrated with relevant consumer engaging content. 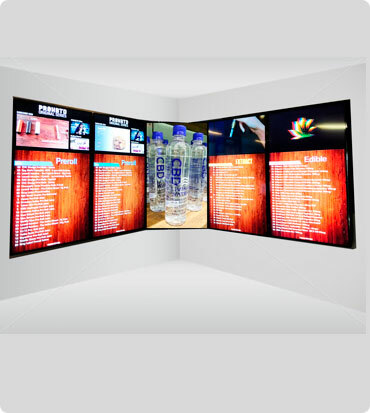 You will never have to waste time updating menus and programming inventory changes with our auto-generating menu system. 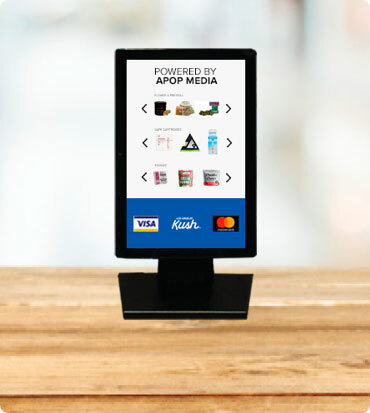 Any changes or additions made to your menu from your POS system is automatically updated on the digital menu. 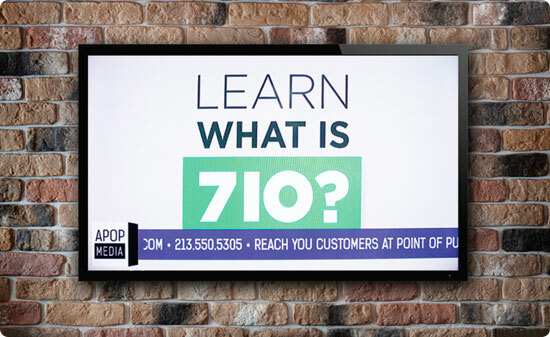 Grab a customer's attention and showcase your latest announcements at the same time. 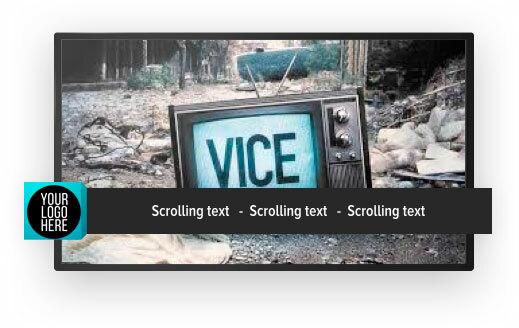 The ticker shows anytime a video is on screen. 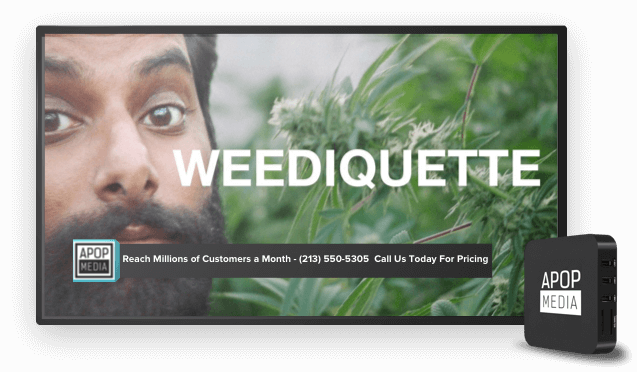 If you are serious about advertising in cannabis, own a cannabis brand, or want to expand your audience, we have the most valuable space in advertising for cannabis. @2018 Apop LLC. All Rights Reserved. 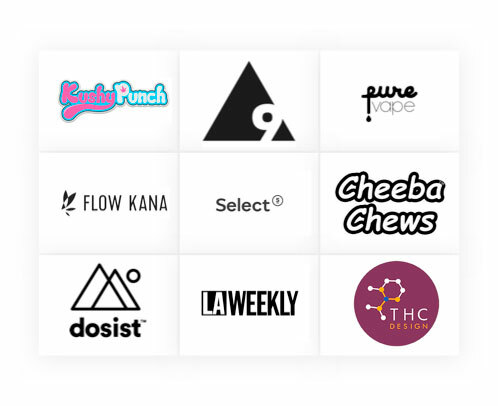 All logos and trademarks are the property of the respective trademark owners.